At the Pusey Library exhibit “To Serve Better Thy Country,” President Drew Faust greets ROTC undergraduates. As Harvard’s president, Faust has been instrumental in returning ROTC to the University. University officials, staff, administrators, faculty, alumni, and students stood alongside alumni veterans and active servicemen and -women on Thursday evening at a Pusey Library reception for an evocative exhibition that traces the interwoven histories of two of the country’s oldest institutions: Harvard and the military. As Harvard’s president, Faust has been instrumental in returning ROTC to the University. She welcomed Navy ROTC back after a four-decade absence in 2011, following the repeal of the military’s “Don’t Ask, Don’t Tell” policy. She marked the return of Army ROTC in 2012 and signed an agreement in 2016 reinstalling Air Force ROTC. Jonas Akins ’01, M.B.A. ’12, was an intelligence officer in the Navy for six years, and he is now working on a research project with Tom Nicholas, the William J. Abernathy Professor of Business Administration, about Harvard Business School during World War II. Akins thanked Faust for her efforts. While looking over the Pusey Library show, Amy ROTC cadet and human evolutionary biology concentrator Alannah O’Brien ’19 was surprised to find she was in the exhibition. O’Brien, who hopes one day to become an Army doctor, laughed with friends and other cadets as she spied a photo of herself in olive athletic gear passing Dillon Field House after a workout at Harvard’s Murr Center. 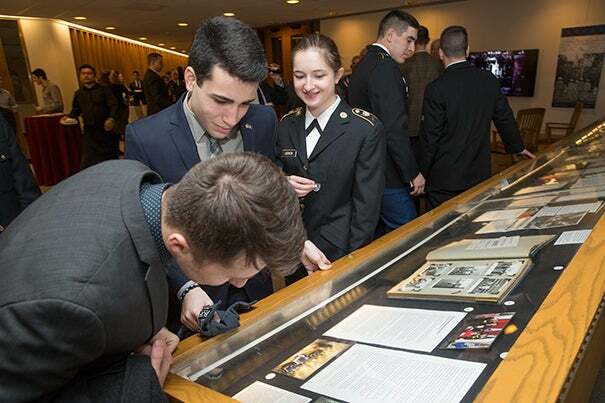 Displayed on the gallery’s walls and in five cases, the show’s diverse ephemera track Harvard’s military connections from the colonial militia period to the present and include correspondence, journals, posters, sheet music, and numerous photographs. One of those pictures was the favorite item of Evelynn M. Hammonds, Barbara Gutmann Rosenkrantz Professor of the History of Science and of African and African American Studies. Hammonds was dean of Harvard College when Faust singed the agreement with then-Navy Secretary Ray Mabus, J.D. ’76, that brought ROTC back to campus. Hammonds pointed to a photograph of Alfred Frazier White, an African-American soldier and Harvard Law School student from 1916 to 1918 who died of influenza at Camp Humphreys in Virginia in 1918. 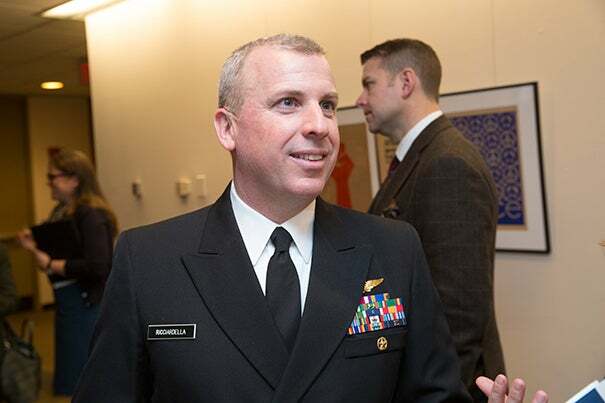 Ted Ricciardella, a Navy commander and a HKS national security fellow, perused the show’s World War II material.